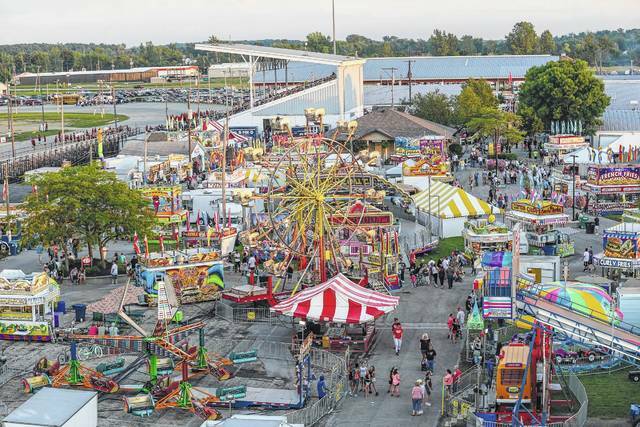 A view from the Ferris wheel at last year’s Allen County Fair on Friday evening. The Allen County Fairgrounds is located at 2750 Harding Highway, Lima. Gates are at state routes 309, 117 and Bowman Road. Daily gate admission is $7 for ages 7 and older. Ages 6 and younger are free. Discounts are available Monday and Wednesday with a coupon clipped from the fairbook or printed from the fair’s website. Coupons are also available on the fair’s website for vendor discounts. From 8 a.m. to 6 p.m. Tuesday, get $2 off with a can of food at walk-in gates only. This benefits the West Ohio Food Bank. Parking is free. Follow signs and heed the direction of parking attendants. Some parking areas are reserved, and cars will be towed. Handicapped parking is at Gates 1-4 and Gate W.
The parade was held Aug. 12 to give every exhibitor a chance to participate.